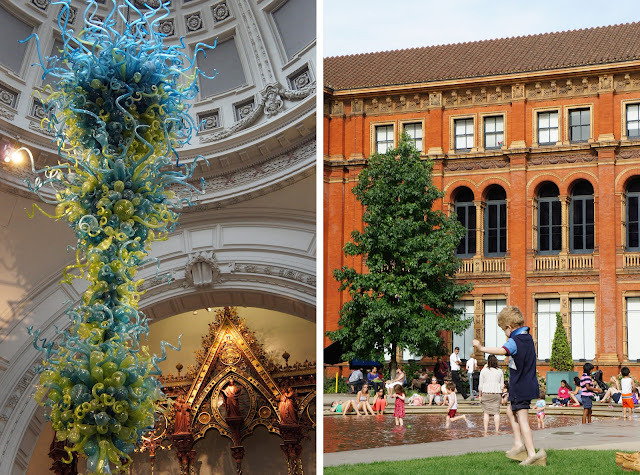 the V&A's main entrance & centre court - isn't that little boy the coolest? warning - i'm about to go all art history student on you. London is a city for museum lovers. During our weekend there in September, we hit up (more than) a few: the National Portrait Gallery, the Tate Modern, the V&A and the Natural History Museum. The best excuse to cram all of those in? They are free! Admission is charged to select temporary exhibits (e.g. we forked out €18 each to see Damien Hirst at the Tate) but general admission is free at many of London's major museums. Just one of the many things that make this city is way cool (and way ahead of the pack). Another reason to love London's museums: when we're travelling sometimes we don't know what to do with ourselves at night (besides eating and drinking). Do you have the same problem? But all of these London museums are open until 9 or 10 pm a few nights a week. This allowed us to maximize our daylight hours doing outdoor things, and get cultured once the sun went down. Saving some museums for the evenings also relaxed our sightseeing pace. The National Portrait Gallery was a delight, and we were lucky to catch the BP Portrait Award Show 2012 (I loved the First Prize winner!) while we were there. Yeah, yeah, I know visiting a portrait gallery sounds like the most boring thing ever. But I promise it's not. Portraits are fabulous. When I (the former art history student) take Mike (the accountant) to art galleries I always find portraits to be the most interactive and interesting pieces for us to chat about. There's almost always something to say about them (but don't take my word for it, go look at some). The V&A was everything I expected it to be (it's hyped up in every undergrad art history course) and more. It's a gorgeous building, so impeccably curated (if you can entice Mike to carefully observe glass vases, you're doing something right), and so gosh darn comfortable. We especially fell in love with the centre court, where families came to splash in the wading pool and lounge on the lawn (+ free Wifi!) Free museums that people want to come to just to hang out? Yes please. But perhaps not surprisingly, Mike's favourite London museum was the Natural History Museum. Dinosaurs! Whales! Skeletons! Camels cut in half! This is the stuff of every 5 year old boy's dreams. And I count myself lucky to be marrying a guy who is really a 5 year old at heart, because it's kind of awesome to be reminded to stay playful at any age. psst...Watch this Ted talk (I did years ago and I'll never forget it) to find out why. Come back tomorrow (if you aren't sick of my museum soliloquies) and I'll tell you about my favourite London museum. So cool that London's museums are free and open late - must be so fun to browse through the galleries in the evenings :) I can only imagine how much the art history major in you must have been loving it! i pretty much never go to museums except on the free days!